1-3 TOFIELD SODBUSTER RODEO & STREET FAIR See page 102. 23 METIS CROSSING NATIONAL INDIGENOUS PEOPLES DAY CELEBRATION See page 44. 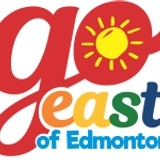 23 LAMONT COMMUNITY FAIR & PEROGY FESTIVAL See ad page 69. 2 ELK ISLAND NATIONAL PARK BISON FEST See ad page 23. 23-24 MARWAYNE LEA PARK JAMBOREE See ad page 78. 23-24 VIKING CLOVERLODGE STAMPEDE See ad page 106. 24 UKRAINIAN CULTURAL HERITAGE VILLAGE VINTAGE DAY & THE FRIENDS UKRAINIAN MUSIC FEST See page 22. 24 BATTLE RIVER TRAIN EXCURSION HISTORIC HEISLER HOTEL See ad page 131. 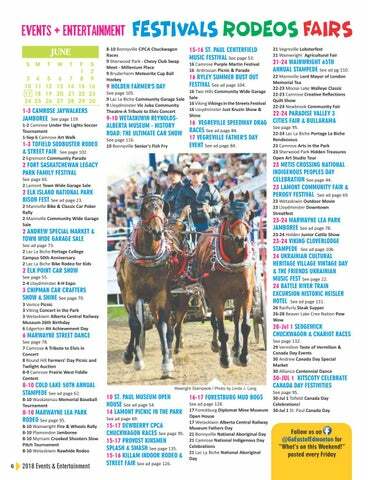 21-24 WAINWRIGHT 65TH ANNUAL STAMPEDE See ad pg 110. 8-10 COLD LAKE 50TH ANNUAL STAMPEDE See ad page 62. 10 ST. PAUL MUSEUM OPEN HOUSE See ad page 54. 14 LAMONT PICNIC IN THE PARK See ad page 69. 15-17 DEWBERRY CPCA CHUCKWAGON RACES See page 95. 15-17 PROVOST KINSMEN SPLASH & SMASH See page 135. 15-16 KILLAM INDOOR RODEO & STREET FAIR See ad page 126.